Secret sugar method - See Below! DEAR DAN: First, I hope all of those associated with the emergency situation are okay and doing well. As for your ceramic tile, I would not just yet pronounce it DOA (dead on arrival). Depending upon certain factors, including but not limited to, amount of excess grout, the amount of time the grout has been left to harden, the surface texture of the tile, and the amount of patience you have, you may be able to salvage the tile job. It most definitely is worth a try. CLICK HERE to get FREE & FAST BIDS from local tile repair contractors. These tools will get up most of the grout paste left behind. The wood stick with sharp edges will prevent scratches as you try to pop off large pieces of grout. 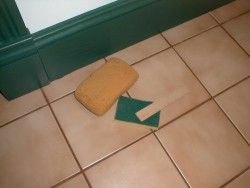 Vacuum up the dust as you work, so the grout grit does not scratch the glazed tile. The best tool to use is an oak wood stick with sharp edges will prevent scratches as you try to pop off large pieces of grout. The easiest place to get oak is a pallet slat. Visit an business that uses pallets for incoming and outgoing freight and they'll have a crap pallet around. You just have to peel off one of the top boards and then saw it so it's the shape of a paint stirring stick. If getting oak is too much work, and it can be, then just use a paint stirring stick. Slowly scrape the excess grout with the stick edge. Cut into the grout with the corner of the stick. Do NOT attack the grout like a bulldozer cuts into a hill of dirt. The stick will ride up over the grout. IMPORTANT TIP: Brush away or vacuum up the grout grit and dust as you work. If you don't, the grout grit will scratch the glazed tile. Floor grout contains fine pieces of silica sand and it's extremely abrasive. The sand will scratch tile fast and it's just about impossible to repair the tiny scratches. The primary ingredient in many ceramic tile grouts is Portland cement. It takes days and often weeks for ceramic tile grout to reach full strength. At this point in time, you're working against the clock. Every hour after the grout was installed, it gets much harder to remove it. I've found that if you start to remove excess grout within 48 hours after it was installed, it's not too hard. The longer you hesitate to remove the grout, the harder it becomes to remove. If, by chance, the grout was an epoxy grout, you're toast. It's virtually impossible to remove excess epoxy grout from tile surfaces without damaging the tile. The grout removal process requires just a few simple tools. You need some small pieces of wood that have very square-cut edges and several brand new nylon scouring pads. This is the BEST grout removal tool I've ever used in conjunction with a wood stick. These nylon pads do a fantastic job. CLICK THE IMAGE ABOVE NOW TO ORDER THEM. The first thing to do is to work in a small area to see how successful the grout removal techniques will be. If you have rapid success and can get a few tiles clean within a few minutes, that's a very good sign. Use the wood sticks to remove large clumps and layers of grout. Do NOT use metal scraping tools, putty knives, etc. The metal will permanently damage the glazed surface of the tile. Don't allow contractors to use metal tools. I prefer to use pieces of oak that are 1/4 to 3/8 of an inch thick, one-inch wide and perhaps six inches long. The oak hardwood holds its square-cut edge longer than a softwood like most paint stirring sticks. Use a power saw to make sure all of the edges are square cut instead of slightly rounded. The crisp square edge aggressively cuts through the grout down to the surface of the ceramic tile. Before you begin to attack the grout-covered tile with the stick, pour a little water on it. The water acts as a lubricant and helps to prevent micro-scratches on the glazed tile surface. It should not require excessive pressure to get immediate results. The trick to removing large grout deposits is to just cut into the grout with a corner of the grout stick. Don't try to push the entire square face of the oak stick into a large clump of grout. Once the heavy deposits of grout are removed using the oak stick, rinse off all of the grout particles and grit from the surface of the tile. New tools and products hit the market all the time. Farther down below you'll see traditional grout sponges that work really well for this job. 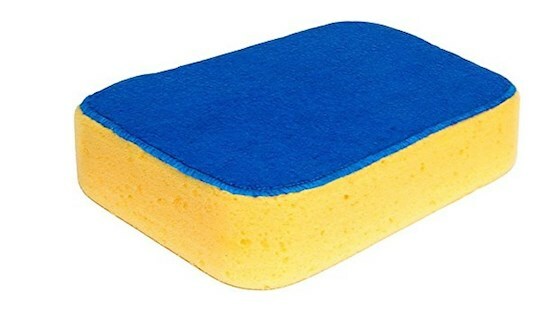 But right here is a newer sponge that combines a microfiber surface on one side that really helps you get rid of the DRIED grout haze on ceramic tile. CLICK HERE NOW to order one of these sponges. 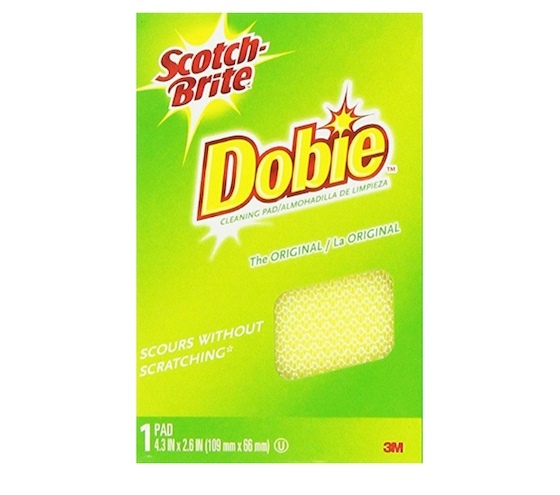 Here's a fantastic newer sponge that will do a great job of cleaning dried grout haze. CLICK THE IMAGE NOW TO BUY ONE. Add more fresh water to the surface of the tile. Get the nylon scouring pad wet as well. Begin to scour the tile surface with the pad adding plenty of fresh water as you scrub. You should see dramatic results within seconds. You can test to see if all of the grout paste has been removed by doing a final rinse on the tile(s) you just worked on. Use a soft cotton cloth to dry the tile. You can also dry it quickly with a regular fan or a hair dryer. Wet tile can trick you. It often looks perfect but frequently after it dries you will see a slight grout haze upon it. Hold a piece of spare tile next to the clean and dry tile to see if it has been restored to its original condition. The biggest challenge of the job will be restoring the grout lines between the tiles. When tile grout is wet, it is very easy to make the grout lines uniform using a special grout sponge that has rounded edges. These are wonderful grout sponges with rounded edges. I've used these for decades with amazing results. CLICK THE PHOTO IMAGE NOW TO ORDER THESE SPONGES. The sponge tools the grout line smooth. But now, the grout in between the tiles is anything but uniform. Use coarse sandpaper to slightly round off a corner of one of the oak sticks so that it resembles a woodworker's chisel. As you push and pull the stick back and forth along the grout lines, the rounded corner will cut a profile similar to what the sponge would have created. Once again, introduce some water to the grout to act as a lubricant. Do not give up if you do not see immediate results. Try to be patient with the wood stick as it may be far easier to dress the grout this way than to remove the grout and start over. If you do decide to re-grout, try to make sure you do when you will not be called away from the house! I know this is going to sound crazy, but try it. Take one gallon of warm water and dissolve a cup of sugar into it. Take this sweet solution and pour it onto excess grout on a floor. If you have wall tile with too much grout, then soak paper towels in the solution and place them on the tile. Keep the tile wet with the sugar water for at least two hours. After this dwell time is complete, use a new Dobie nylon scrub pad and scrub a small area. You should see instant results. It may take more than one application of sugar water to completely remove the grout film. I'm looking for a grout removal tool. It is in a diamond shape, and all I can find are the ones that are triangle shaped. I am a residential remodler, and we use 16th in grout lines from time to time. This tool works best for removing this set from the grout lines. Home Depot used to carry them, but no longer. Do you know where I can get my hands on a few? It would be most appreciated! Hi, a recent bathroom remodel project while overall a success resulted in a very ugly shower pan. The floor was supposed to be these pebbly rocks peaking from sanded grout. Instead I have a pan that that looks like a mess because the guy poured in unsanded grout or something and it is frozen into place and looks dirty. I need to fix this on my own. So is there some kind of weak acid solution or something I can paint on the grout and keep washing to fix this? The remodel was an expensive project and I don't want to damage surrounding tile. Only want to fix the bottom of the pan. Advice needed and appreciated. Rad, I created my 15-Minute Consult for situations like this. You need more than a one-sentence answer. I am having a similar issue. I can barely see the penny round tiles on my shower floor because the installer left so much grout. It has been there for about 2 weeks and is not sealed yet. How do you fix this? Simple. Read my column above. I tell you exactly what to do. Thank you for the tips! I was able to salvage my tile job and the grout came up rather easily with the water and sugar mixture. Good information. THANK YOU SO MUCH !!! I USED THEN SUGAR WATER AFTER THE CHEMICAL SOLUTION FAILED TO WORK. THE SUGAR WATER DID THE TRICK. THANK YOU, THANK YOU, THANK YOU. Some fool (me) decided to leave nearly all the grouting on top for 2-3 hours. In hindsight, I shouldn't really have been surprised to find the tough stuff wouldn't budge. My tiles are stone, not sure what the top is covered with but it seems to take a lot of abuse. Thanks for the advice on here; I used a mixture of the methods from sugar solution to nylon brush. I was able to get away with using a metal blade - especially needed as my tiles aren't flat - but made sure I checked the results first on a scrap piece of tile. I read elsewhere that the pack instructions often say leave the grout 15-20 mins before wiping (in my case, I didn't heed this advice), though that you should take it off immediately for most tile types. Mine finally look done, so again thanks for the advice.